Ticker Sense: S&P 500: Still OVERSOLD! Even though the market rallied 11% yesterday, the S&P 500 is still oversold! 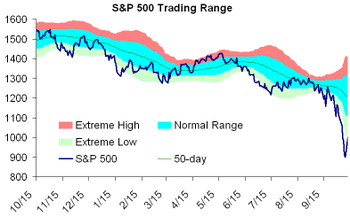 As shown below the S&P remains more than two standard deviations below its 50-day moving average. The gift basket for dads may be designed as a survival gift basket like a daddy diaper tool kit. Interesting post, we can provide a similar insight into the currency markets. Ticker Sense was founded and developed by analysts at Birinyi Associates. Birinyi Associates continues to own and manage all content. © Copyright 2012, Birinyi Associates, Inc. Ticker Sense is published by Birinyi Associates, Inc., PO Box 711, Westport, CT 06881. The information herein was obtained from sources which Birinyi Associates, Inc. believes reliable, but we do not guarantee its accuracy. None of the information, advertisements, website links, or any opinions expressed constitutes a solicitation of the purchase or sale of any securities or commodities. Please note that Birinyi Associates, Inc. or its principals may already have invested or may from time to time invest in securities that are recommended or otherwise covered on this website. Neither Birinyi Associates, Inc. nor its principals intend to disclose the extent of any current holdings or future transactions with respect to any particular security. You should consider this possibility before investing in any security based upon statements and information contained in any report, post, comment or recommendation you receive from us.